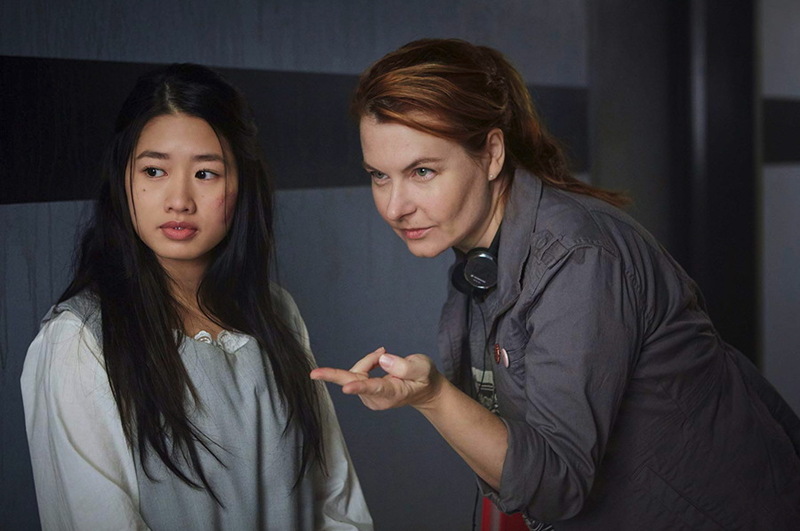 Level 16 is an SF thriller, directed by Danishka Esterhazy. SF/science fiction/horror is one of the strengths of Anglophone Canadian cinema and since I’m keen to see SF and Canadian films, especially by women, it seemed an obvious choice for me to book. What I hadn’t realised was that this screening was at the beginning of the first full day of ‘FrightFest’ as a festival within the main festival. Sitting on the front row (numbered seating instead of the usual unreserved) in a jam-packed GFT1 was a new experience. I’ve never seen so many cinemagoers in black T-shirts together before. This was all generally good fun but the announcements and promos and a short film extended the running time of the slot considerably. When I finally escaped the theatre I discovered that I had 1 minute before my next (2 hours plus) feature. That’s not good! Level 16 was preceded by a short video welcome/introduction by Danishka Esterhazy on a recording (she’s currently shooting in Hawaii) and she told us that this was a film inspired to some extent by her own schooling. She must have had a grim time. 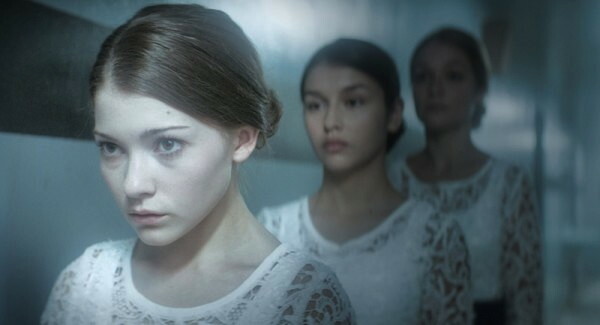 The film is set in the very near future or alternative present and focuses on a group of teenage girls in a mysterious boarding school. They are never allowed out of their windowless rooms on the grounds that the air/light outside will damage their skin. Each day they are put through rituals of learning about appropriate behaviour for young ladies, but not much conventional academic learning. They wear long concealing dresses and take medication each day (described as vitamins). They are taught via TV screens, old ‘public service’ films and Hollywood classics. Each girl is named after a classic Hollywood beauty and the two central characters are ‘Vivien’ and ‘Sophia’. The only two adults they see most of the time are the tall, glamorous blonde Miss Brixil and the seemingly kindly Dr Miro. But if they are punished, the girls are taken away by black-clad ‘guards’ and put in ‘solitary’. If they are obedient the girls gradually progress to the next ‘level’ and when they reach ‘Level 16’ they believe that prospective adoptive parents/employers are going to select them to live in beautiful homes. These visitors come to see the girls who are presented in a drug-induced sleep. However, it is inevitable that one day a girl is going to rebel and avoid the medication. Once she realises what is happening will she be able to convince the others who, after years of indoctrination and drug regimes are likely to be resistant? Is it possible for the girls to act collectively given their histories? That Brontë reference is also an indicator of the kind of research Esterhazy undertook since Level 16 benefits from a study of Victorian etiquette books and ideas about how young women should behave. I think that Level 16 would be an interesting film to show to students, because of the way it confounds that array of assumptions (e.g. teenage girls won’t watch SF, women don’t direct SF, there needs to be a romance etc.). It also offers a useful comparison with more traditional SF films on similar topics such as the two Stepford Wives films and something like Never Let Me Go (UK-US 2010) with its much higher cultural status. The success of The Handmaid’s Tale on TV probably helps as well. This film opened the Cannes Film Festival Critics Week in 2017. It also received scripting support from the Sundance Festival. It has finally found its way into UK distribution via Altitude and I’m very pleased to have had the opportunity to see it. The festival links suggest an art film, but this is also a film that draws on popular film genres such as romance, horror and fantasy. Inevitably, it’s the kind of film that has received rave reviews and also some very negative ones – but here’s why it is definitely worth seeing. The starting point for writer-directors Fabio Grassadonia and Antonio Piazza was a terrible event in 1993 which had an impact on most Sicilians. It involved the Mafia and led to much soul-searching across the population. But instead of attempting to tell the story in a realist, procedural manner, the filmmakers (from Palermo) decided to create a form of fantasy/ghost story because that seemed to be a more appropriate way of representing the impact of the events. The narrative begins as children leave the elementary school in a village in the hills of Central Sicily. A rather beautiful young boy wanders into the woods and is followed by a girl from his class. She hides behind a tree watching him playing with a large colourful butterfly which rests on his hand. Around the girl’s feet a creature is snuffling, a mustelid of some kind (mink, pine marten?). Whatever it is, this is an animal usually very wary of humans. We seem to be in a fantasy situation. A little later the girl is frightened by an angry black dog. Hansel and Gretel in the woods? We will eventually discover that these thirteen year-olds are Giuseppe (Gaetano Fernandez) and Luna (Julia Jedlikowska). Their day ends when Giuseppe, after showing his show-jumping skills on his horse at a remote stables, suddenly disappears. As Luna sits on a rock gazing into the distance, waiting for Giuseppe to emerge from the stables, we see behind her and slightly out of focus what appears to be a police car taking the boy away. When Luna goes to his house, she can’t find any reason why Giuseppe has disappeared. Luna creates an image of her psychic investigations? I won’t spoil the narrative development. I’ll only note that while the rest of the village, including Luna’s parents and the village school, remain silent about the disappearance, Luna and her friend Loredana are determined to find him. Luna is a highly intelligent girl, a talented artist and someone who has the ability to investigate the disappearance in her dreams/nightmares as much as in her waking hours. In the still above she creates what might be an image from her dreams. 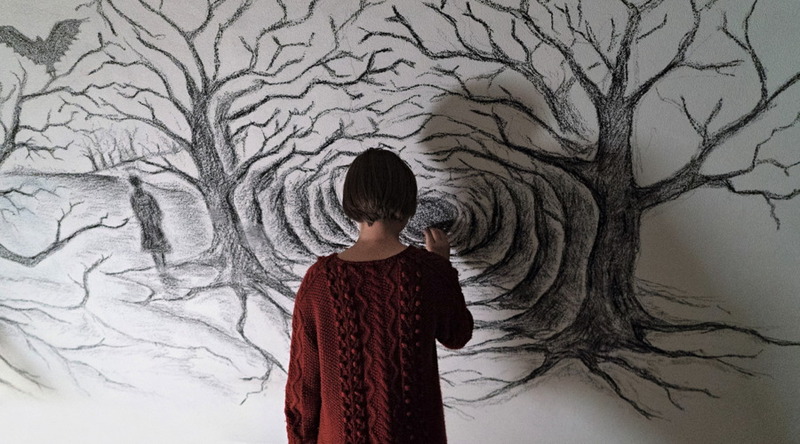 The drawing reminded me of a recent Spanish-British film, A Monster Calls (Spain-UK-US 2016), though in Luna’s case she wants to rescue Giuseppe from his captors and not summon them. The director of A Monster Calls is J. A. Bayona, whose career took off with promotion by Guillermo del Toro and it is del Toro who is arguably the key reference here with the young girl, the fairy underworld and the all too human horrors of Spanish fascism in Pan’s Labyrinth (Spain-Mexico 2006). There are a number of generic ‘fairy tale’ touches in Sicilian Ghost Story with a pet owl, a falcon and Luna’s rather grim mother (the Swiss actor Sabine Timoteo). One reviewer has described the overall look of the film as ‘gothic and oneiric’ [dreamlike], which feels like a good call. Luna’s red coat (and red jumper) have also been seen as a nod to Nic Roeg’s Don’t Look Now set in Venice – but ‘Little Red Riding Hood’ seems a better bet. Giuseppe and Luna re-united under her red coat – or is it all just a dream? Luna’s searches, whether ‘real’ or dreamlike are accompanied by winds and especially by underwater scenes in a nearby lake. I thought the cinematography by Luca Bigazzi was excellent – and so it should be since he has been responsible for the look of many well-known Italian films by Paulo Sorrentino and other celebrated directors. Music and sound design is important too with a variety of sound effects enhancing the dreamlike qualities of Luna’s search. I’ve noted that there have been criticisms of the film. Some have complained that the dividing line between reality and fantasy is never clear, but that seems an odd argument since it is presumably the point of the narrative that the experience of the disappearance and its aftermath is difficult to understand and represent as a real event. The real events took place in 1993-5 but the film doesn’t mark this too carefully and it probably makes mistakes in presenting the period settings as eagle-eyed audiences have noted. I suspect the film’s ending will also cause problems for some audiences, but not for me. Overall I found the film to be an imaginative attempt to deal with a major social issue in ways which allowed me to think differently about how communities and individuals within them might respond to terrible events. This is a tough film which disturbs but which has at its centre an extraordinary performance from Julia Jedlikowska in her first role. The narrative is fuelled by the determination of a single character to keep searching despite the collective hostility of an entire community, most of whose members are too frightened to take action themselves. Luna’s friend Loredana is a reliable friend but without Luna’s devotion to Giuseppe, she will eventually find that time will heal. But I’m wondering what will happen to Luna. There is an interesting review of the film here. This is a new title directed by Jeremy Dyson and Andy Nyman which they have adapted from their original stage play. Andy Nyman also stars in the film as ‘Professor’ Goodman. He is actually an investigator with his own television show. His investigations are into fake spiritualist. His guru in this activity is Charles Cameron (Leonard Byrne) who apparently disappeared some years earlier. But Cameron re-appears and asks Goodman to look into three claims of mystery sighting of ghosts or equivalents. The three investigations occupy much of the film so it operates a little like a portmanteau film. The BBFC advised that it was ‘strong horror [and] language’. In fact there were only a couple of serious shocks/surprises and the only amount of schlock is right at the end of the film. In between we see Goodman investigate by interviewing the subjects of these ghostly events. The witnesses never complete their stories as we face an abrupt cut at a moment of high tension. The third event is completed verbally after a similar cut. Such ambiguities are deliberate because the way the narrative works leads up to an unexpected ending. In fact the publicity poster or the film requests audiences not to reveal the ‘secret’ of the ending. What I can note is that the film opens with Goodman’s voice-over narrating flashbacks to his childhood. And one of the aspects of the film is the way that experiences in childhood and at school haunt adults later in life. I saw the film at a Picturehouse preview. It is fairly well done. The ghostly sequences are effective and not especially scary. The film uses the 2.35:1 frame and there are some well photographed exteriors. The sound adds to the atmosphere with both effects, noises and music. And there is a popular song which emphasises the resolution of the film. The cast also offer an effective representation of characters and events. Jeremy Dyson is from Leeds and there are a number of Yorkshire locations in the production. The presentation was preceded by a publicity poster on-screen. The film does not quite justify the hype here. But what was slightly odd was that it contained deliberate misspellings [that are not in the standard poster] with reverse lettering and exchanged letters in some of the text. I could not figure how this related to the film. I had also seen the trailer earlier which contained one character who claimed the events were ‘unexplainable’. I found this inexplicable. Nico (Javier Bódalo) is the virgin. Spanish cinema has a high reputation for genres such as horror, fantasy and science fiction – whether the films are aimed at cinéphile audiences, mainstream Spanish audiences or more cultish followers. The Night of the Virgin, as the title perhaps indicates, is skewed towards the third option, though it perhaps has some pretensions to attract the first. This is a horror film trading in disgust, but also trying to make some political points – though whether these are accessible to audiences outside Spanish culture is debatable. It’s New Years Eve and the film’s first trick is to invite us to a live Spanish TV programme preparing for the New Year’s Eve celebrations in Bilbao – the extract is presented as a small 4:3 image within a CinemaScope frame. (IMDb suggests the film’s ratio is 2.70:1 ‘Ultra CinemaScope’.) Eventually the TV image expands to at least fill the frame vertically and then the image switches to the full ‘Scope frame to show a bar/night club where the titular character is attempting to find a woman to take away his virginity on the last night of the year. It looks like he will have no luck but at the last an attractive older woman invites him back to her apartment. The virgin, Nico (Javier Bódalo) has borrowed a dress shirt and jacket to go out but he seems bewildered by the club. He’s also being goaded on by his mates and we see their text messages to him. Soon his hormones take over and a familiar scenario from teen horror emerges – he will seek a sexual adventure and something will go wrong. When he and the woman, Medea (Miriam Martín) reach her dingy apartment block, she warns him not to step on a cockroach as it will bring him bad luck – but, of course, he immediately does. We assume that he doesn’t know the story of Medea the sorceress. This Medea seems to have embraced sorcery from a different culture but she is certainly not to be messed with. What follows is a horror narrative with some comic elements which involves every kind of bodily fluids. It explores the desire for and fear of sexual acts and their place in rituals. Will Nico survive the night? What else goes on in this old apartment block? The narrative has a twist and the film ends with another TV broadcast which this time reports from outside the apartment block. Would I recommend the film? I’m afraid that I don’t feel competent. I’ve seen enough Spanish horror and read enough Spanish history to know that there are some possible satirical/political points here but I can’t work out what they mean (apart from the attack on those idiotic New Year’s Eve TV programmes). This form of ‘body horror of disgust’ is not for the squeamish and unfortunately that includes me. The film has an 18 certificate for its UK release (strong violence, gore, sexual violence, sexual activity). Writer Guillermo Guerrero and director Roberto San Sebastián have produced a film that seems to have attracted extensive interest by specialist film festivals around the world. 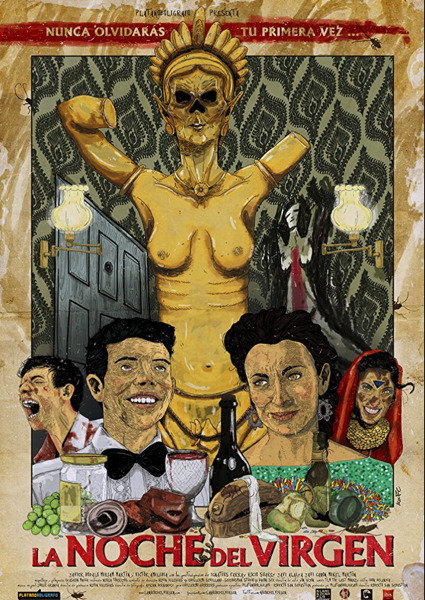 The film’s promotion cites many prizes and many glowing reviews from horror fans – “Disgustingly Unforgettable”, “Extreme, Grotesque and Gloriously Insane” are just a couple of them. The film is arguably too long but the music is entertaining. It’s available from Matchbox Films, release date April 2 and can be pre-ordered from Amazon UK. 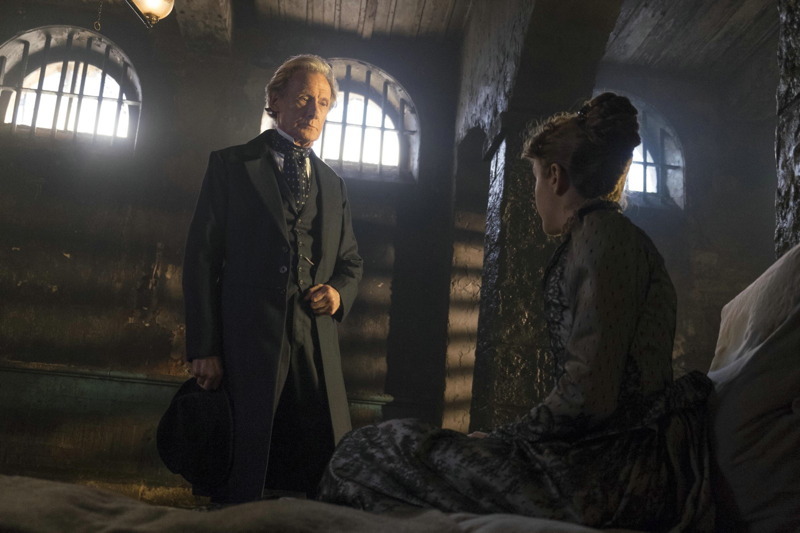 The Limehouse Golem is a fascinating film for several reasons. It seems to have divided audiences and overall its box office performance has been ‘soft’ for Lionsgate in the UK (albeit on one of the worst weekends of the year for the cinema b.o.). It’ll be interesting to see what happened in Week 2. My personal interest in the film is mainly because its two key locations of an 1880s East End street and the interior of a music hall were recreated in the atmospheric setting of Dalton Mills in Keighley. This complex of three textile mills built in the 1860s is a listed building with several unique features which have been cleverly utilised. The complex has been used for a range of film and TV locations including North and South (2004), the TV adaptation of Mrs Gaskell’s novel and it lies adjacent to Keighley Station and the Keighley & Worth Valley heritage railway. Using other key locations in the North of England and then studio work in London, The Limehouse Golem has a very strong visual aesthetic with minimal visible CGI. This and the performances of an impressive cast are its strengths. The scriptwriter Jane Goldman is known for her collaborations with Matthew Vaughn and Mark Millar but perhaps the important link here is her 2012 adaptation of the Woman in Black by Susan Hill. The Limehouse Golem has been adapted from a 1994 novel with the title Dan Leno and The Limehouse Golem by Peter Ackroyd. Ackroyd specialises in biography and novels about London and its history. The Limehouse Golem is about the trial of Elizabeth Cree, charged for the murder of her husband, a would-be playwright. The narrative involves going back over Mrs Cree’s emergence as a star of Dan Leno’s music hall. Leno is one of three historical figures (Karl Marx and the novelist George Gissing are the others) who appear to have been in the British Museum Library reading room at the same time as John Cree and whose testimony must be explored. I haven’t read the novel, but in the film, Inspector Kildare (Bill Nighy) is the investigator of this mystery which is presented through a series of flashbacks, some with ‘unreliable narration’. I suspect that, as in the case of The Woman in Black, there is possibly a degree of snobbery in some of the reactions to Goldman’s adaptation of a genre novel by an acclaimed ‘literary’ writer into a popular film. The other negative reactions may come from genre fans of horror or mystery films. The latter, in particular, can sometimes dismiss a narrative if they deem it too easy to ‘solve’ as a puzzle. It’s really a question of how you approach a narrative in order to be entertained. It may well be the case that The Limehouse Golem is an easy ‘puzzle’ to solve, but I would argue its pleasures are found in how the events are presented on screen. 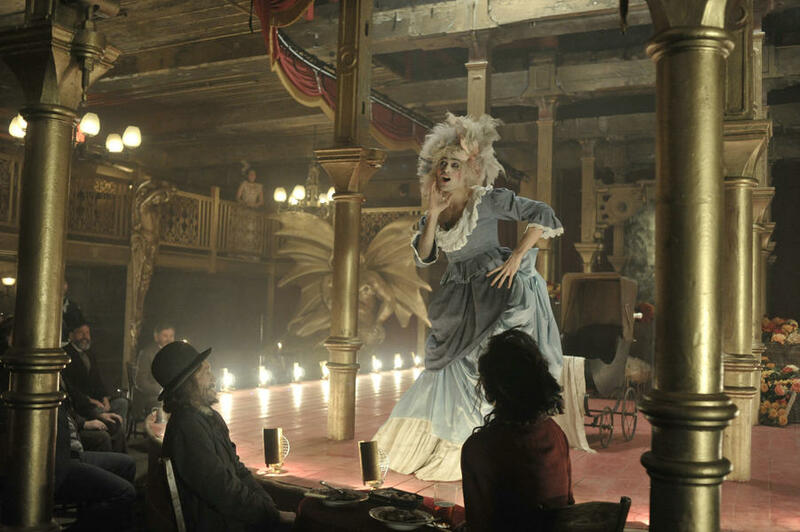 The setting of the film in the Gothic world of late 19th century London is shared by a range of current film and TV offerings, including the TV series Ripper Street. What makes the setting particularly interesting for audiences in 2017 is the ability of familiar genre set-ups to absorb and use contemporary concerns in its storylines (whether this is intentional or not and this film first appeared in 2016). In this case there is an emphasis on gender identities and immigration. One character is an ‘exotic’ acrobat played by the Spanish actor María Valverde and the the Jewishness of the East End is explored in some detail, including in the reference to the ‘Golem’, the monster formed from clay that can be either protective or malign in its actions in relation to Jewish communities. Interestingly, it is his Jewishness that singles out Karl Marx rather than his work on Das Kapital. Cross-dressing is a feature of Dan Leno’s music hall performances, into which Lizzie Cree is inducted. These are traditional performances in an English context but the introduction of a ‘repressed’ gay sensibility by two of the characters is something that appears to have gone down badly with some audiences. I think that Peter Ackroyd is a gay writer so this may be in the original novel. The narrative could have introduced Oscar Wilde and his circle since he was active in London from the early 1880s. But then there is no claim to historical accuracy in the film and ‘real’ characters like Dan Leno are presented anachronistically several years out of place. The clearest contemporary reference is to celebrity gossip and tabloid sensationalism so that in one scene an unworldly Inspector Kildare arrives at a crime scene overrun by goulish spectators and Daniel Mays as a uniformed constable explains that the blood attracts crowds because it is cheaper than paying to watch (or read) a ‘shocker’. The narrative is indeed about celebrity, ‘performance’ and the 1880s equivalent of reality TV. I didn’t enjoy the gore on display in the murders but this may please others. The discovery in the film is Olivia Cooke, a young actor (23) from Oldham playing Lizzie Cree most convincingly. 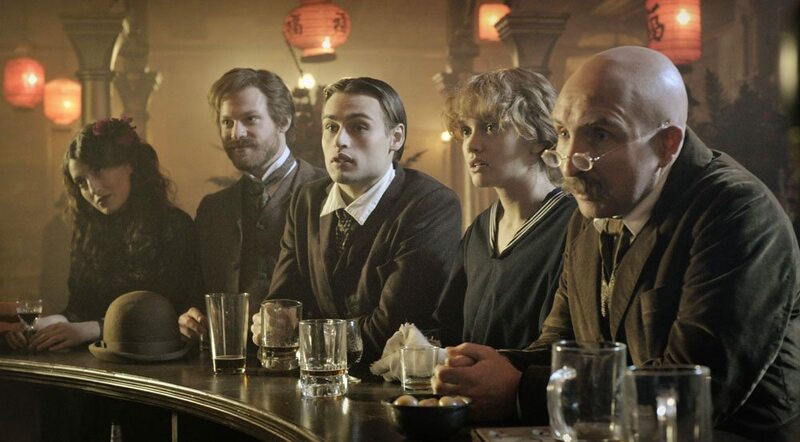 Douglas Booth as Dan Leno, Henry Goodman as Marx and Eddie Marsan as the music hall manager lead the fine team of players and credit must also go to director Juan Carlos Medina, cinematographer Simon Denis (who also shot episodes of Ripper Street and Peaky Blinders) and the whole production design crew. I did note the comment that though the music hall scenes include interesting musical sequences, we never see any musicians – how odd. The trailer below gives an impression of the use of locations and sets and I’ve chosen the stills to show this as well. Elsa Lanchester as Mrs Sloane descends the stairs to the basement with George Brent as Professor Warren behind. I watched this recently in preparation for an event on film noir and enjoyed it very much. It’s a significant film in many ways, though its short running time (82 minutes) seems to indicate a ‘B’ picture. 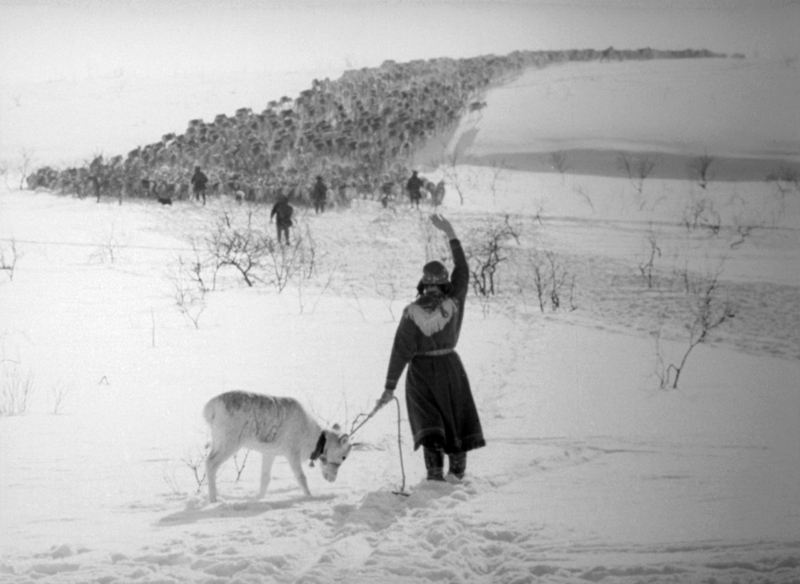 The cast and crew and the sheer artistry of the film do, however, point to an ‘A’ picture from RKO. Researching the film, I came across a fascinating website, The Film Noir File: A Dossier of Challenges to the Film Noir Hardboiled Paradigm written and compiled by Dan Hodges. I should have been aware of this site because it explores the arguments against the conventional academic film histories of film noir and also the supposed American uniqueness of the genre/style. I would tend to support both of the main aims of the website. The Spiral Staircase challenges the ‘paradigm’ of film noir in one sense and ‘fits’ it in another. It is not based on the kind of ‘hard-boiled’ crime fiction of the 1930s/40s, but it is directed by an émigré German director, Robert Siodmak and photographed by another, the Italian Nicholas Musaraca (who had worked in Hollywood since the 1920s). In fact, Siodmak and Musuraca were two of the principal ‘creators’ of film noir as later described by Hollywood film scholars. Musaraca worked under Val Lewton in RKO’s ‘B’ unit in the early 1940s on films such as Cat People (1942) and would later shoot the film noir classic Out of the Past (Build My Gallows High, 1947). Siodmak came to RKO after early noirs such as The Phantom Lady (1944) and The Suspect (1944). He would go on to make another recognised noir classic, The Killers, also in 1946. So, how does The Spiral Staircase challenge the paradigm? The first films noirs to be studied extensively in retrospect were based on hard-boiled crime stories, often featured a ‘doomed man’ and a femme fatale and were contemporary in setting (though they might update 1930s stories to the 1940s). The Spiral Staircase is based on a novel by Ethel Lina White, a British writer who turned to crime fiction in the 1930s. Three of her novels were adapted for cinema, beginning with The Lady Vanishes in 1938 (UK, Alfred Hitchcock). She died in 1944 and didn’t see either The Spiral Staircase or Unseen (1945). The Spiral Staircase was adapted by a radio drama writer Mel Dinelli. In the first murder a young woman is dressing when she is strangled, creating this strong composition . . .
We can guess what will happen, but the film is highly engaging with its narrative twists and turns and the superlative camerawork, lighting and set design make it always watchable. Helen is both ‘damsel in distress’ and investigator (and arguably the ‘final girl’ as identified in the horror films of the 1990s). 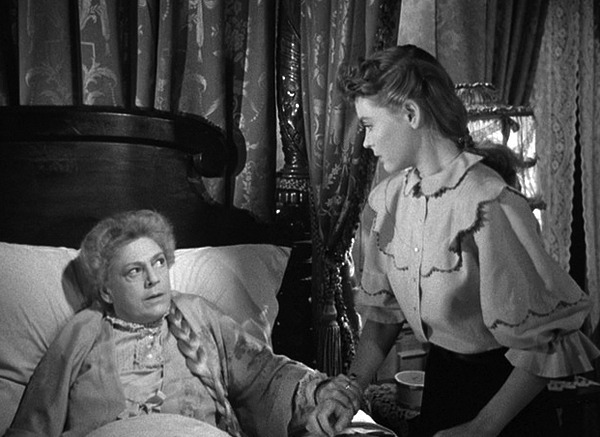 As well as Helen and Mrs Warren, the film also features two other significant female roles played by Rhonda Fleming (who went on to lead roles in the 1950s) and Elsa Lanchester (wife of Charles Laughton and dogged by her early Hollywood success in The Bride of Frankenstein). The narrative draws primarily on the suspense thriller repertoire. The visual style suggests the horror film as much as the film noir and it is supported by a strong soundtrack mix of effects referring to the terrible storm outside, the banging of windows and shutters and the sound of the wind and rain. 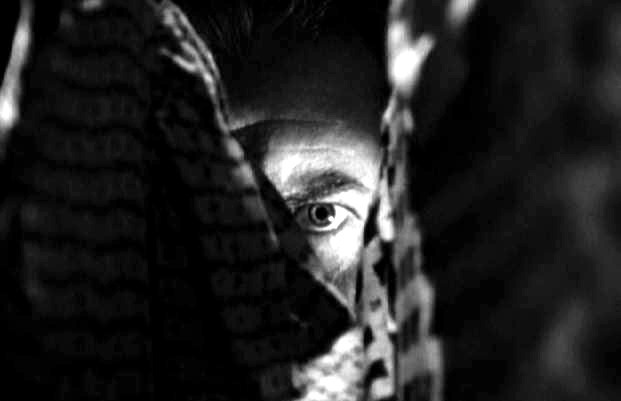 Horror and film noir arguably have roots in common in German expressionism of the 1920s and the same roots also apply to the particular cycle of female-centred melodramas that became popular in the 1940s. Many of these reveal a certain kind of paranoia about being in the ‘old dark house’. 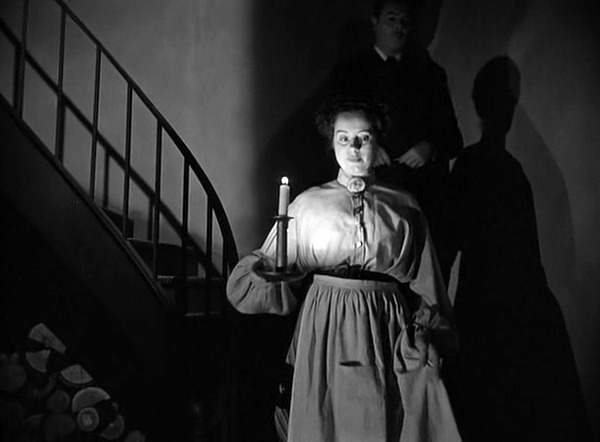 In Gaslight (UK 1940 and US 1944), both films adapted from Patrick Hamilton’s play, a woman in London becomes fearful that her house is subject to strange events. Her relative was murdered in the house some time ago but is her present husband trying to frighten her? Ingrid Bergman is the frightened woman in the Hollywood version with clear film noir links. The Spiral Staircase also links to the Barbara Stanwyck ‘woman in distress’ film Sorry Wrong Number (1948) in which she plays a woman who is bed-ridden, like the Ethel Barrymore character in the Siodmak film and similarly fearful of an attack. These melodramas are also films noirs. The view in the mirror which shows downstairs. Melodrama implies other familiar conventions. Helen is affected by her trauma so that she can’t speak – and therefore can’t ask for help or convey what she knows quickly. 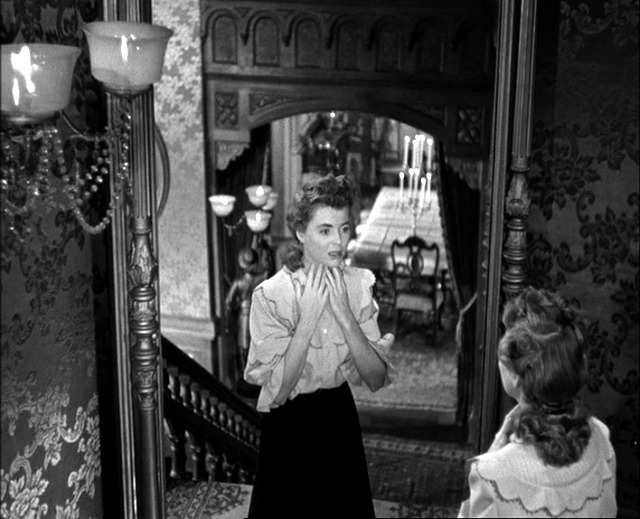 In the scene above she looks at herself in the mirror, a common image from melodrama that might suggest that there are two Helens or that she has something to hide that might not be revealed to the other characters. The mirror also allows the composition of images which are ‘disrupted’ in their presentation of narrative space. Here the deep focus which operates throughout the film shows the dining room below. In this case, the mirror image helps conjure up Helen’s fears that being unable to speak will be dangerous in the febrile atmosphere of her gothic surroundings. This image also gives an indication of the detailed set design and ‘set dressing’ which adds greatly to the power of the images. The art direction duties are credited to Albert S. D’Agostino and Jack Okey. D’Agostino worked on 27 films released in 1946. The Spiral Staircase certainly benefits from the experience and expertise of personnel working within the studio system. Helen’s ‘lack’ of a voice is also a feature of certain melodramas where such ‘lacks’ are often seen as symbolic. In this film, the lack is also imagined by Helen in a sequence representing her internal thoughts and in another where a visual effect obscures her mouth. I think that Dan Hodges is right to challenge the ‘paradigm’ of American film noir. So many different kinds of films have benefited from the application of themes and style features associated with noir. I think I’d describe The Spiral Staircase as a noir melodrama melded with the suspense thriller/horror film.